So There's No New Topic Anymore? And Shifting to Newer Languages? ⚽ And, we put them all together on stage! ⚽ Is Ruby "Done" already? 'São Paulo'.upcase #=> "SãO PAULO"
⚽ Full-time Ruby committer at Heroku Inc.
⚽ You'll see so many "unmaintained"
⚽ Send us your patches! 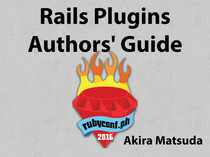 For What Do We Use Ruby? ⚽ God father of the language "Ruby"
⚽ m is for "Embedded"
⚽ Because Nintendo was a RubyKaigi sponsor! comfortably play NES games with ruby! ⚽ To check if we could achieve "Ruby 3x3"
⚽ "Transcendental Ruby Imbroglio Contest for rubyKaigi"
Playing with Ruby is Fun! 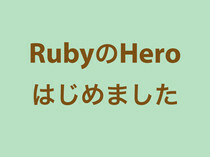 I Got the RubyHero Award! ⚽ Can't we unify them? ⚽ Don't forget to visit us when you're coming to Japan! ⚽ This is a lovely situation! ⚽ Thank you for inspiring Ruby! 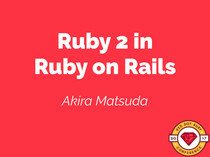 ⚽ Why don't you just keep using Ruby? ⚽ Because Ruby is considered slow? ⚽ This should be nicely resolved in Ruby 3! ⚽ Because Ruby cannot deal with types? 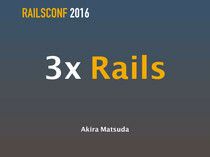 outside of the Rails ecosystem? ⚽ People are eagerly working on them! ⚽ Let's do this together! ⚽ There's really no reason "why not Ruby"! ⚽ Maybe because Ruby is essentially fun! ⚽ Thank you Fabio for inviting me! ⚽ Fun of Programming is expanding! Keep Having Fun with Ruby! ⚽ Enjoy yourself being a Rubyist!